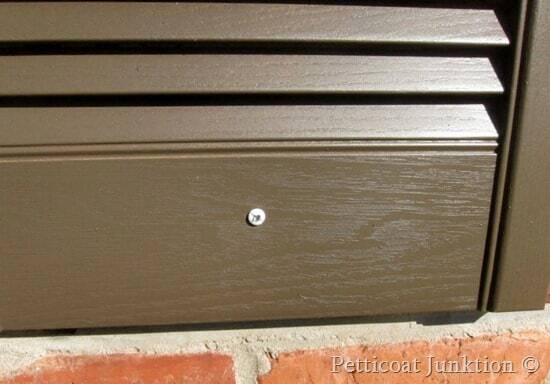 This is a detailed tutorial on how to paint vinyl shutters. We changed the color of the shutters from white to brown and added to the curb appeal of the house. White is kind of boring. Yeah, ya’ll usually see pictures of my paint projects and no pictures of me. That’s the way I like it. I’m featuring the Junktion Technical Specialist (aka hubby, aka The JTS) in this post. The shutters on our house are those vinyl ones and also white, very white. Our house was built in 1967 or there abouts and we have owned it since 1988. At some point we removed the wood shutters and replaced them with vinyl ones. I don’t remember if the wood ones were in bad shape or if we had the vinyl ones put up when we had the vinyl soffit and gutters installed. My memory isn’t what it used to be. Anyway, I have always hated those white shutters. So after many years I did something about it, or to be exact, the Junktion Technical Specialist did. It was on his honey-do list. He took the shutters down while I was at work so no pictures of them on the house or him removing them. 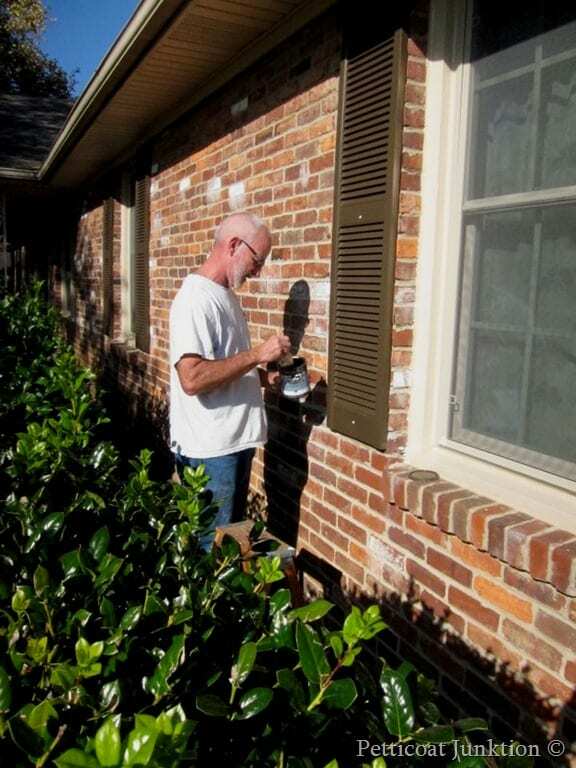 While in the process of taking the shutters off the house be sure and mark them so you know which ones go on which windows. 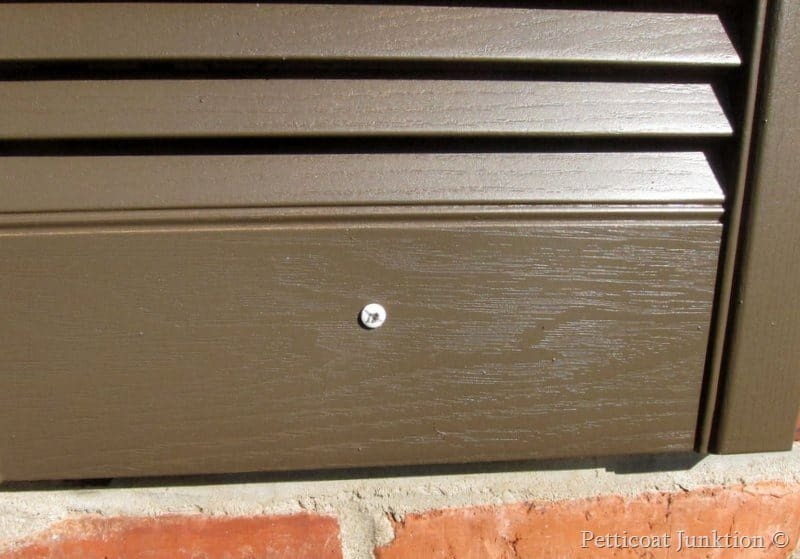 This is very important because although the shutters are all the same size, the screw holes in them and the screw holes in the exterior brick (or siding) may not be the same from window to window! One way to mark them is to number them starting at one end of the house with the number one and so on and also mark the top, just don’t paint over the markings, that would be bad. 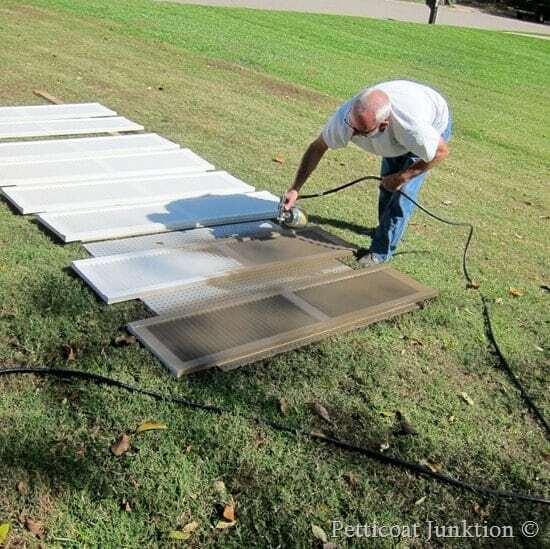 Wash the shutters with a garden hose or pressure washer and let the shutters dry for a couple of days. Lay them out flat or stand them up to paint.. Just protect anything around them from paint spray. 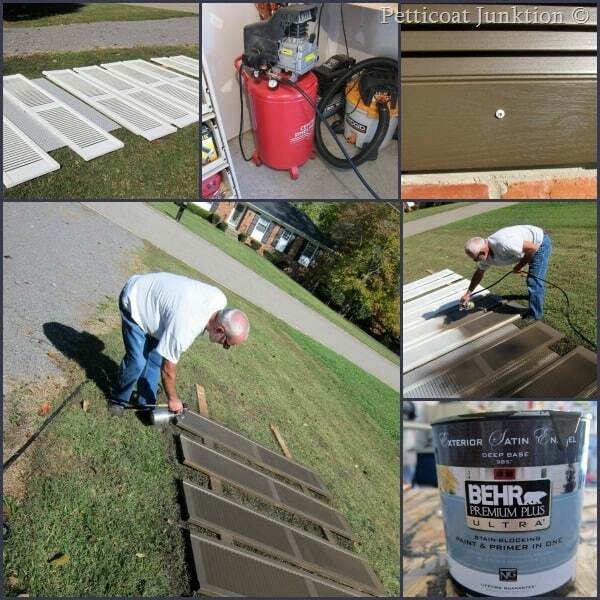 The JTS painted the shutters using a paint gun connected to an air compressor. 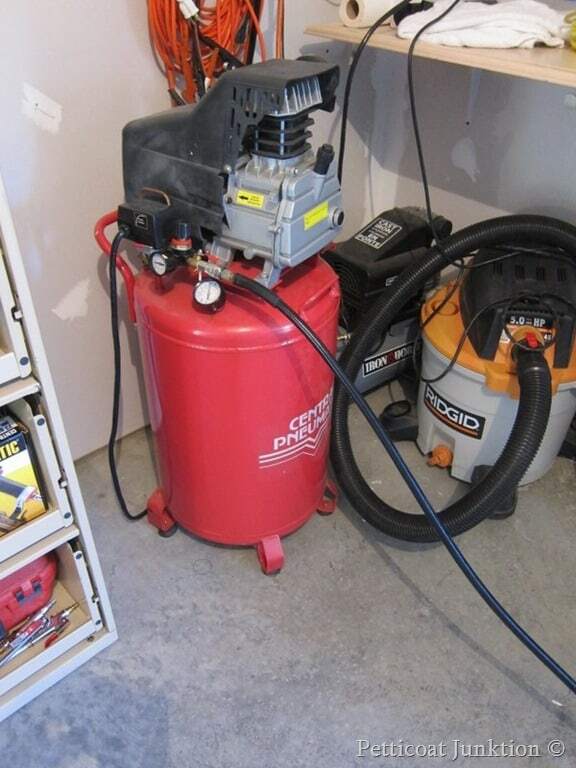 If you don’t have an air compressor you can also use a spray paint gun that just plugs into the wall. I love my HomeRight Finish Max Spray Painter. At the time we painted the shutters I didn’t have the HomeRight but I do now. It would be even easier to use than the spray gun and air compressor. I love Behr paint. 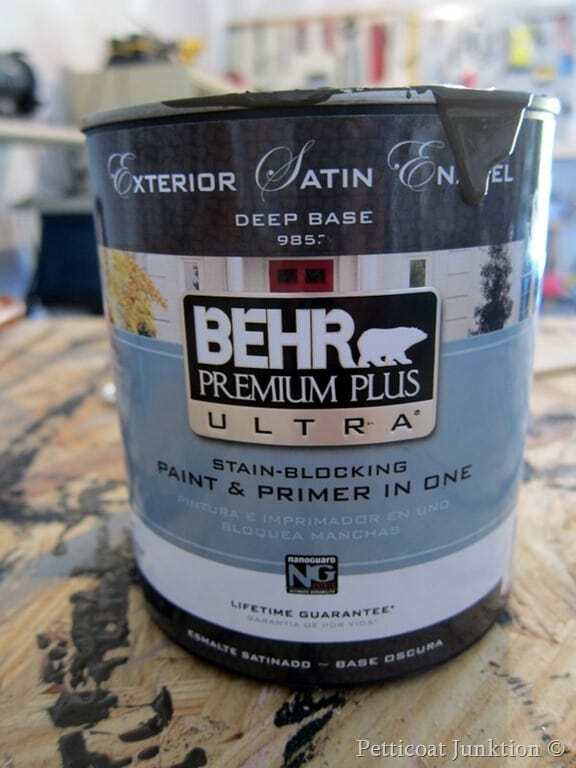 We used Behr Premium Plus Ultra paint and primer all in one. I chose a dark brown to go with our new roof. We had to put on a new roof in the spring after all the hail storms. And I love it. Who gets excited over a new roof! Its a lighter color than our old roof and really updates the look of the house..
And this is how easy the job is. Really, even if I was doing it I would say it was easy. 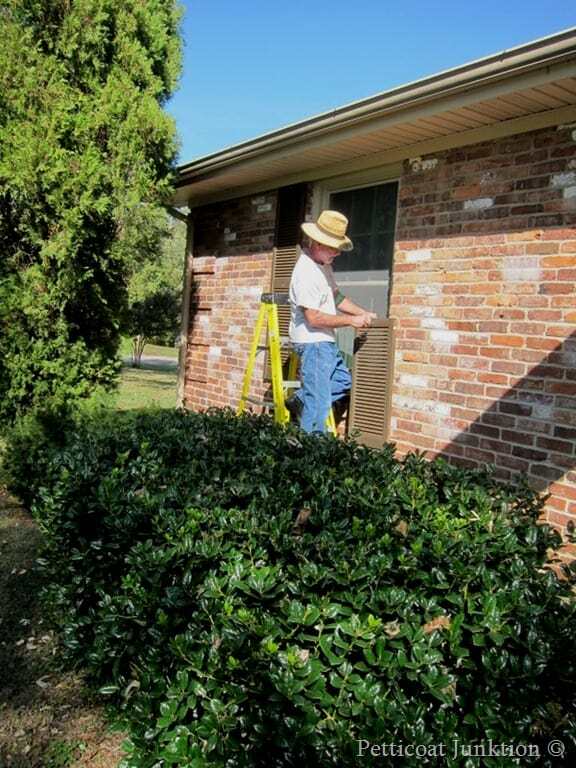 Trying to paint louvered shutters with a brush is a lot of hard work. Dry time is only about 2 hours depending on the weather. Hubby put the shutters back up the same day he painted them. See this screw. How could you miss it, right. All it takes is a little touch up. Wow, those shutters look so much better. I painted the front door and the glass storm door (see the tutorial for the doors here) and bought new light fixtures for under the front porch. I’ll show you those too. Maybe in the next post. 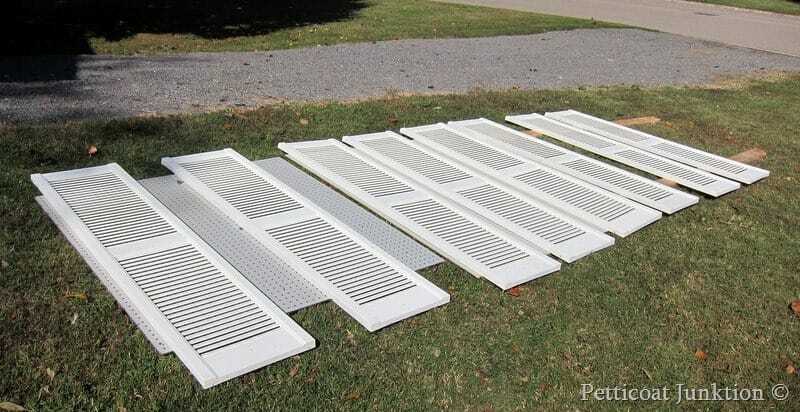 Now you know how to paint shutters. Put the hubby to work this weekend or do it yourself. You might want to look at that HomeRight Finish Max Paint Sprayer….click the photo. 1. Did you have to thin the paint? 2. How many gallons paint did you need? We have 18 shutters! Lisa, I think 1 gallon would be more than enough and yes we did thin the paint with water. I don’t know what ratio but probably 1 part water to 3 parts paint. It’s something you have to play with! Let me know how it goes. That’s a lot of shutters! Oh how I wish you had posted this about a month ago! When it was warm. My husband told me I could paint our shutters because they are fading. There are only two, on the front of the house. Love the painted shutters. Do you have a picture of the whole house with them up? We had white shutters, I hated them and they were falling apart so we were going to get vinyl ones. Couldn’t decide on a colour so I roughly painted one set a charcol gray and they stayed there for about 3 years with 1 set gray and the other 4 white! It bugged some people like crazy, but you would be surprised how many people didn’t even notice we had one set of shutters a different colour! We have now taken them all down, but still haven’t replaced them.